The saying goes, "You learn something new every day." Sometimes, the lessons we learn or the stories we live out are worth jotting down so we never forget. 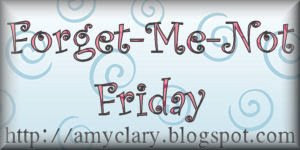 Forget-Me-Not Friday is a place to share one special moment from your week. Post that moment on your blog and leave your link below in Mr. Linky. Remember, sharing and swapping stories is a great way to get to know other people and make new friends. Wednesday was a rough night for all of us here. Alex woke up crying at 3am and couldn't return to sleep. I tried everything I knew to do to help him. A little after 5am, Alex was crying and the hubster was on his way to work so I called him crying. I was so exhausted and frustrated. The hubster calmed me down and I returned to my son's side to try once more to help him out. I picked him up and said, "Mommy wants to help you, hun. What do you need?" Alex instantly stopped crying and nuzzled his head on my shoulder. Then, I put him back in his bed only this time I curled up beside him and we both went to sleep. That moment was so precious to me. There's just something beautiful about a sleeping child. I love this idea, I try to do this next week. Great idea! Please check out my contest this weekend! You have been given an award...Yippy! Check out my blog.